I won this copy of The Thousand Autumns of Jacob de Zoet in a Goodreads contest. It’s not usual for me to take two weeks to read a book. It’s true that this one is long, but it’s also such a rich and involving read that I didn’t want to rush. And that really almost never happens. I’ve been waiting for the chance to tell you about it, and since it goes on sale tomorrow, today is the perfect day. I received The Thousand Autumns of Jacob de Zoet in late April, after the mildest winter I’ve known since I moved to Canada. I remember that I had started reading something else, but Myron and I went for an walk after dinner and stopped at the mailbox—what a wonderful surprise to find it waiting for me only two days after finding out it was coming. That beautiful evening, I practically pranced around on our walk through the neighborhood waiting to get home and sail into it. In late 1799, young Jacob de Zoet takes a position with the Dutch East India Company, hoping to return in a few years with the fortune it will take to win his sweetheart. But things are not that easy—once he arrives in feudal Japan and becomes fascinated with the marred beauty of an intelligent midwife, he is drawn in to a startling secret that I don’t even want to hint at because I want you to discover it for yourself. And then, once he’s drawn in, the way it changes his life will engross you and make you proud you know him until you remember that he is a fiction. 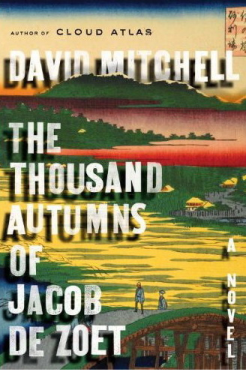 The two weeks of cool spring days I spent in Jacob’s world were heightened by the effect of reading David Mitchell’s prose. I took the book everywhere, on every bus, in every restaurant; I stayed up late and got up early to spend time in this world. And yet it broke every rule for what I usually like in a book. There is only one major female character. It’s set in a time in which I know absolutely nothing about the history. The Japanese names had me at a bit of a loss for the first hundred or so pages (there are a lot of characters in this book, and a lot of them have long names, and the best thing you can do is learn as many of them as you can quickly). And it’s far from light—I usually like to read a story like this in the winter when I can tuck in and concentrate. With all those rules broken, it was like a charming child who can get away with anything by flashing a grin. I devoured it. After a slowish start while I tried to get the Dutch names straight, and then the Japanese ones, it all came together. As the story picked up—as Jacob negotiates with the powers that be on the man-made island of Dejima, as he copes with his growing attraction to midwife Orito, as he struggles with life in a culture that is not his own while retaining his sense of himself—as I saw all the threads of the story being tied together, it was like the experience I had reading Cloud Atlas (another of Mitchell’s books that turned me into a happy evangelist). I read it carefully. I didn’t want to miss anything. And I didn’t want to leave, but I ran out of pages. If you ever find yourself in the mood to spend a long time in a book’s world, and you don’t mind spending a fair portion of that time in the kind of fog that means you don’t know what’s coming next, this is an incredible treat. Here is a link to an excerpt of it at the Times; you’ll see what I mean about the many names. Trust me; they come together. And it’s a revelation when they do. This is the first time I’ve reviewed a book here; in keeping with the theme of the site, though, I’m only going to do it when I really, really like a book, and a free copy doesn’t buy a good review from me. I think The Thousand Autumns of Jacob de Zoet is a beautiful thing. It is a lovely favor for your intelligence, which has worked very hard lately, don’t you think?